Dopamine— when extacy alters the activity of dopamine it causes a surge in euphoria and increased energy/activity. Norepinephrine— the effect of extacy on Norepinephrine causes an increase in heart rate and blood pressure, which is highly risky for people with heart and blood vessel conditions. Medical research has not targeted a specific link between the concentration of extacy in blood and euphoric effect (feeling “high) induced by extacy pills. MDA, the main metabolite in extacy, is detected with concentrations varying from 5 to 10%. 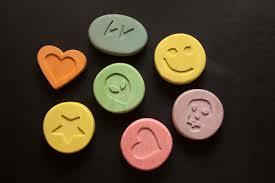 After you take one dose of 50 mg extacy, 0.02-0.08 mg/L MDMA concentration can be detected in the plasma. And if you would increase that dose of extacy to 150 mg, the concentration will reach levels of 0.44 mg/L MDMA in plasma. The peak levels of concentrations of MDMA in the first case will be at 1.5 hours later, and up to 4 hours later for the second case. Ecstasy produces a group of effects, mostly manifested as impaired brain function, and can last for up to 3 hours after last dose. It is important to note here that users under the influence of extacy often lose track of time. The environment start producing powerful feelings or strong, clear images in the mind and , colors appear much brighter and lines seem to be blurry. Activities are perceived as many times faster and often users report the feeling of levitation which is characterized by the rising of a human body and other objects into the air by mystical means.